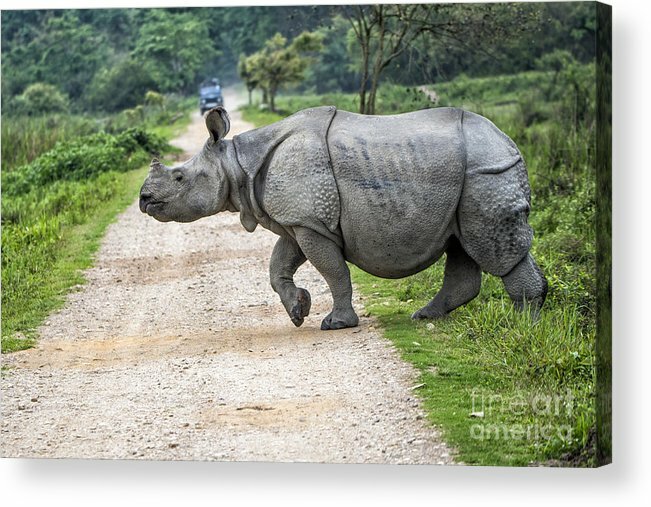 Rhino Crossing by Pravine Chester - 10.000" x 6.625"
Rhino Crossing acrylic print by Pravine Chester. Bring your artwork to life with the stylish lines and added depth of an acrylic print. Your image gets printed directly onto the back of a 1/4" thick sheet of clear acrylic. The high gloss of the acrylic sheet complements the rich colors of any image to produce stunning results. Two different mounting options are available, see below. Thank you Linda. Yes, the wait was certainly worth it ! 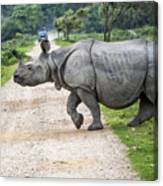 Great photograph of the Rhino crossing the path, well worth the 45 minute wait! The Kaziranga National Park in Northeast India has jeep paths running through it which animals have to cross for free movement across the park. 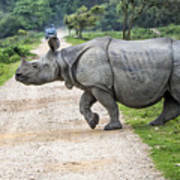 For this shot of the rhino crossing, we waited for almost 45 minutes at a distance as the animal slowly moved towards the path and finally crossed it.